242 pages | 122 B/W Illus. The integration of land use and transport planning is key to making cities sustainable and liveable. Accessibility can provide an effective framework for this integration. However, today there is a significant gap between the advances in scientific knowledge on accessibility and its effective application in planning practice. In order to close this gap, Designing Accessibility Instruments introduces a novel methodology for the joint assessment and development of accessibility instruments by researchers and practitioners. presents six in-depth illustrative case study applications of the methodology, representing a range of cities with different geographical and institutional settings, and different levels of urban and transport planning integration. 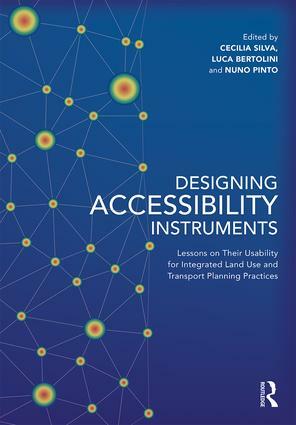 The book is supported by a companion website – www.accessibilityplanning.eu – which extrapolates its content to a broader scope and keeps it updated and valid with new iterations of the methodology and further advances on the initial and new case studies. Cecília Silva is an Assistant Professor at the Faculty of Engineering at the University of Porto, Portugal. She has previously published four books, and was the Action Chair for the COST TU1002 project. Luca Bertolini is Professor of Urban and Regional Planning at the Universiteit van Amsterdam, the Netherlands, involved in ongoing research financed by the Nederlandse Organisatie voor Wetenschappelijk Onderzoek (NWO), and Co-Chair of the Transport Planning and Policy group of AESOP. Nuno Norte Pinto is Lecturer in Planning and Environmental Management at the University of Manchester, UK, and an Affiliated Researcher with the Center for Urban Policy Studies (University of Manchester) and the Center for Land Policy and Valuation (Technical University of Catalonia, Spain) and a National Delegate for the COST TU1002 Accessibility Instruments for Planning Practice in Europe project.